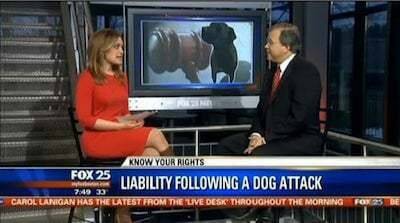 Photo: Attorney David W. White answers questions about Massachusetts dog bite law for Fox 25 TV. Our attorneys represent children and families who have been injured by dog bites and attacks across Massachusetts. When it comes to attacks by dogs, Massachusetts law is very strict: The owner or keeper of a dog is strictly liable for personal injuries, scarring, and wrongful death caused by a dog bite or dog attack. It is necessary to prove that the defendant was the owner or keeper of the dog. It is not necessary to prove that the dog has caused personal injury before, or that the dog is vicious. The injured person must show that he or she was not teasing or tormenting the dog, and that trespassing was not involved. If a young child is injured, there is a presumption that the child was not teasing or tormenting the dog. Fortunately, most dog bite, dog attack, and other animal bite injuries are covered by homeowner’s insurance. In Massachusetts, homeowner’s insurance covers liability (bodily injury) and sometimes provides medical payments coverage to the person injured by the dog bite or dog attack. If you or your child has been injured, it is important to consult a lawyer who is experienced in handling dog bite cases in Massachusetts. The Boston dog bite lawyers at Breakstone, White & Gluck have represented children and adults injured by dogs in Boston, Cambridge, Lowell and across Massachusetts. We have handled cases involving the most serious of injuries, those involving police dog attacks and other types of animal bites. Contact us today at 800-379-1244 or 617-723-7676 or use our contact form. Dog bites and dog attacks can cause very serious personal injuries. Dog bites can cause scarring—often facial scarring—other disfigurement, and often severe psychological trauma. Dog bites on children, because of their small size, are very frequently on the face. The psychological injury caused by a dog bite or dog attack can often be permanent. If a dog attacks a bicyclist or a pedestrian, other personal injuries may result from being knocked to the ground, including fractures or dislocations. What should I do if I get bitten by a dog in Massachusetts? Does the dog have to bite me to file a dog bite claim? How long will it take me to retain a recovery for my dog bite case? What if the dog's owner has no insurance? Under Massachusetts law, you may have the right to file a claim against the owner or keeper of a dog that bites or injures you. It is not required that the dog actually bite you. If the dog causes an injury such as a trip and fall, bicycle or motorcycle accident or other injury without even touching you, you may have a right to file a claim. What should I do after I get bit by a dog? The first thing you should do is get medical treatment and insure that the dog's shots are up-to-date. Therefore, it is essential that you identify the owner of the dog and find out as much information as you can about the vaccination status of the dog. Does the dog have to bite me? Although most animal attack cases involve bites, there is no requirement that you are actually bitten by the animal. For example, a bicyclist may be caused to crash because of an on-rushing dog. A visitor, such as a mail carrier or delivery person, may be chased and caused to fall down. The dog may just jump up on you, causing you to fall. In all of these cases, the owner will be strictly liable for the injury resulting from the dog’s conduct. Like any personal injury claim, the value of your dog bite or dog injury claim depends on several factors including the severity of your physical injury, the duration of your symptoms, any scarring or disfigurement that results and finally any impairment to any activities of daily living which you may experience. How long will it take me to retain a recovery for my dog bite or injury case? The length of time it takes to obtain a recovery depends on first and foremost how long it takes you to heal from your injury. Your lawyer should not even begin to attempt to settle your case until you have reached a medical end result. What this means is that you are either fully healed or you are as healed as you are going to be. That determination is made by your doctors who will treat your injuries. When your injuries are healed, your lawyer will attempt to settle the case with the insurance company or owner of the dog. Ordinarily, if a dog owner owns a home, they will have homeowner's insurance coverage. However, many insurance companies recently adopted exclusions in their policies for injuries caused by a dog. If there is no insurance or if there is an exclusion for injuries caused by dogs, then the only recourse will be to pursue the owner of the dog individually. Important consumer tip: If you are the owner or keeper of a dog, you should check with your insurance company to see that the dog is covered, and if not, should consider switching insurance companies. When someone is injured by a dog in Massachusetts, they can file a lawsuit in civil court to recover damages under M.G.L. c. 140, Sec. 155. Read the Massachusetts law regarding dog bites and attacks. You should hire a lawyer you feel comfortable with. Your dog bite attorney should be familiar with the law, and you should have confidence in your lawyer. The lawyers at Breakstone, White & Gluck have the experience, and would be pleased to consult with you when you are choosing who will represent you. Please see our page on How to Choose a Personal Injury Lawyer for more information on getting help for Massachusetts dog bite and dog attack injuries. Our Massachusetts Personal Injury Case Reports describe many of the personal injury cases we have successfully handled on behalf of our clients. For an example of a dog attack on a child, see this dog bite case report. Because the statute of limitations in Massachusetts applies to dog bite cases, victims have a limited time in which to file their cases. If you feel you have a dog bite or dog attack case, it is vital that you act immediately to protect your rights. Please call our experienced dog bite attorneys at 617-723-7676 (or toll free at 1-800-379-1244) or use our contact form.